A short ferry ride for just a few Turkish liras will take you to a captivating archipelago just off Istanbul's Asian side. Commonly regarded as "Adalar" (The Islands) in Turkey, the Princes' Islands lie about 20 km southeast of the city in the Sea of Marmara and are a lovely destination for the perfect day. The Princes' Islands take their name from the Byzantine and early Ottoman period when members of dynasties who fell out of favor were sent into exile on the islands. It wasn't until the late 19th century when regular steamer transportation showed up in the seas around Istanbul were these islands considered possible places to live. Apart from the exiled princes, only a handful of monks found these islands inhabitable then as well, a fact that gives the islands their former name in Turkish: "Kesis Adalari" (Islands of the Monks). Consisting of nine islands – four major and five minor – the Princes' Islands are interesting places to visit, providing a very rare insight into a multicultural society in modern Turkey, possibly resembling that of the Ottoman era. Prior to the 1950s, each of the islands had significant communities of ethnic minorities, which is still the case today but to a much smaller extent. Kınalıada used to be the summer retreat of the Armenian archbishop and the Armenian community of Istanbul, and Burgazada used to be a sleepy village inhabited by Greek fishermen. Heybeliada was the main Turkish settlement on the Princes' Islands, while Büyükada was most favored by local Jews and foreign residents of Istanbul. You'll realize after landing on the islands that there are no cars. A slice of traffic-free paradise is a welcoming relief after the automotive mayhem of Istanbul. Except for the necessary police, fire and sanitation vehicles, transportation is by bicycle, "fayton" (horse-drawn carriages) and foot, as it was centuries ago. The best time to visit the islands is during spring (April-May) and fall (September-October). During these seasons, the weather is neither cold nor hot. Spring is when the yellow mimosa trees, which are the symbol of the islands, are in full bloom with their yellow flowers. There are 15,000 permanent residents scattered across six of the populated islands year-round, but the numbers swell to 100,000 or so during the summer when people from all over Istanbul escape the city heat and visit the islands. With its Turkish name literally meaning "Big Island," this impressive island is the largest among the Princes' Islands covering a total of 5.4 square km. Büyükada was used as an exile destination for close relatives of kings and statesmen who might threaten their political power and as a monastic hermitage during the Byzantine Christian period. Although it hasn't survived to the present day, one of the oldest structures on the island was a convent known as "Kadinlar Manastiri," which was where the Byzantine empress, Irene – who had the monetary built – was exiled to, and for clergymen who lived in seclusion. Divided into two districts, Nizami and Maden, the island consists of two peaks, Yorgi Peak and Hristos Peak, with many steps. With the start of a boat service in the second half of the 19th century, the population of the island started to gradually increase. Ottoman intellectuals, authors and Greeks started populating the island because it was an attractive living settlement. Slowly becoming a symbol of diversity in Istanbul, the islanders started to build different places of worship, a mosque, a church and a synagogue. Thus, Büyükada is one of the best examples of a diverse community living in peace and harmony in Istanbul. One of the most important places of worship in Büyükada is the Hristos Monastery located at the top of the Jesus peak. Also found on the island are the Ayios Dimitrios Church, where Orthodox Christian islanders hold their grand religious ceremony, a Jewish synagogue and the Hamidiye Mosque built by Sultan Abdulhamit II in 1895. Other than these, there are many churches on the island. Two of the churches belong to the Armenians and Roman Catholics, and most of the others were built by Orthodox Christians. In addition to these places of worship, there are also several historical holy water springs called "ayazma." In 1930, the Treasure of Büyükada, which consisted of 207 coins belonging to King Phillip II, the father of Alexander the Great, was found around the Greek cemetery on the island. It was added to the collection of the Istanbul Archaeology Museum. The charming island of Heybeliada (Heybeli for short) is one of the most visited of all the islands. Being the second largest of the Princes' Islands in total area, it is also home to the Deniz Lisesi (Turkish Naval Academy), which was founded in 1773. After getting off the ferry, you will see a number of restaurants, bakeries and gift shops. The island's major landmark is the hilltop Hagia Triada Monastery. Perched above a picturesque line of poplar trees in a spot that has been occupied by a Greek monastery since Byzantine times, this building dates back to 1894. It functioned as a Greek Orthodox theological school until 1971 when it was closed on the government's order, and has an internationally renowned library. Having a length of 2.7 km from north to south and a width of 1.2 km from east to west, Heybeliada used to be known as "Demonisos" or "Chalki" in the past. After the declaration of the Republic of Turkey in 1923, the most important advancement for the island was the opening of the Heybeliada Sanatorium, which was a glimmer of hope for those with tuberculosis. It was later closed and was commemorated in the memory of hundreds of people, including the famous Turkish poets Ece Ayhan and Rıfat Ilgaz in 2005. Later during World War II, the Naval Cadet School was moved to the province of Mersin. After civil servants and students left the island, the island became desolate. After the end of World War II, the Navel Cadet School returned to the island in 1946 and became active again. After the 1980s the island, like other settlements in the city, experienced a population explosion due to immigration and rapid, unplanned urbanization. During the summer, Heybeliada has always been a lively place with its summer home vacationists and tourists. The island has been an important place for famous individuals as well. It was of particular importance to Hüseyin Rahmi, who was a famous Turkish author who spent most of his life on the island. The islanders have looked after their author, and erected a statue of him in the park located in front of the island port. Also, the author's home was turned into a museum, and his name was given to the island's high school. 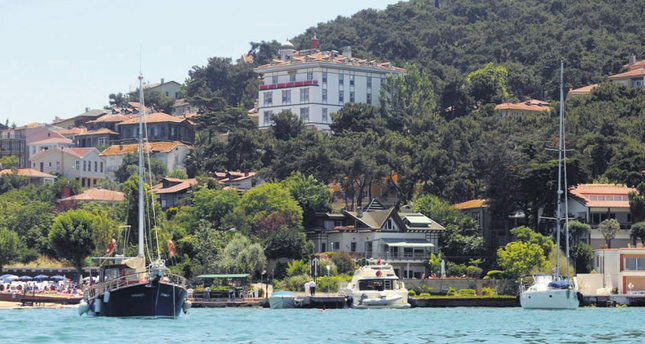 Burgazada is the third largest of the Princes' Islands and is approximately 14 km from Istanbul. The population of the island mostly consisted of Turkish citizens of Greek origin, but after time, native Turks with higher incomes started to immigrate to and populate the island during the 20th century. After the settlement of Jewish merchants in the 1950s, the price of housing on the island increased significantly. Summer villas, houses, kiosks and sanctuaries rapidly started being built along the hillsides, adding an important aspect to the architecture. With its history dating back way before the conquest of Istanbul, the Aya Yani Church is a significant structure for Burgazada. The church is estimated to have been built in 876 A.D., and was restored to take its present form in 1896. Other structures on the island are the Hristos Monastery, the Saint George Hospital, Ayios Loanis (the holy springs of the Greek Orthodox), the Burgazada Sanatorium and the Burgazada Mosque, which was built in commemoration of the 500th anniversary of the conquest of Constantinople. The castle on the island is described by the famous 17th century Ottoman traveler and writer Evliya Çelebi in his famous book "Seyahatname," as being a small castle and located on a cliff on the seaside. Burgazada is also where Istanbul's first private zoo was established. With its name translating to "Henna Island" because of its unique reddish soil, Kınalıada is the island closest to Istanbul. Being the fourth-largest island in the Marmara Sea, Kınalıada was used as a place of exile like the other Princes' Islands during the Byzantine period. The most notable exile was former Emperor Romanos IV Diogenes after the Battle of Manzikert in 1071. According to a myth, the grave of Romanos IV Diogenes is actually located on the island next to the present orphanage. Although Kınalıada lacks woodland, it does have a stone-rich environment. The stones were used to make the walls of Constantinople, and also used in the making of Haydarpaşa Port and the Tophane Dock in the 19th century. Like the other islands, Kınalıada has some major buildings that were built by the Greek minority. The Orthodox Panayia Church and the Greek Elementary School are some of these buildings. Another place of worship on the island is the Kınalıada Mosque, which was built in 1963. As there are no cars on the islands, bicycles are available for rent in several of the towns for about TL 5 ($1.93) an hour. There are also horse-drawn carriages that can be hired for a certain amount of time. A one-hour tour will cost you about TL 45. Fourteen ferries run to the islands each day from 6:50 a.m. to midnight, departing from Kabataş' Adalar Iskelesi dock. The most useful departure times for day-trippers are 9:30 a.m. and 11:30 a.m. The ferries steam away from Kabataş, and on its journey, treats passengers to fine views of Topkapi Palace, Hagia Sofia and the Blue Mosque on the right and Üsküdar and Haydarpaşa on the left. Sea buses (fast ferries operated by IDO) are the fastest option. When stopping at all the islands, the trip will take a maximum of about 55 minutes, and will cost you TL 9 (TL 7.10 with an Istanbulkart). Regular ferries are slower but cheaper. It can take as much as 100 minutes, depending on the number of stops it makes, and will cost you about TL 5 (TL 3.5 with an Istanbulkart).